Last summer, Seif Chirchi and Rachel Yang opened Joule on Sundays to host this really cool series of dinners called the Urban BBQ. 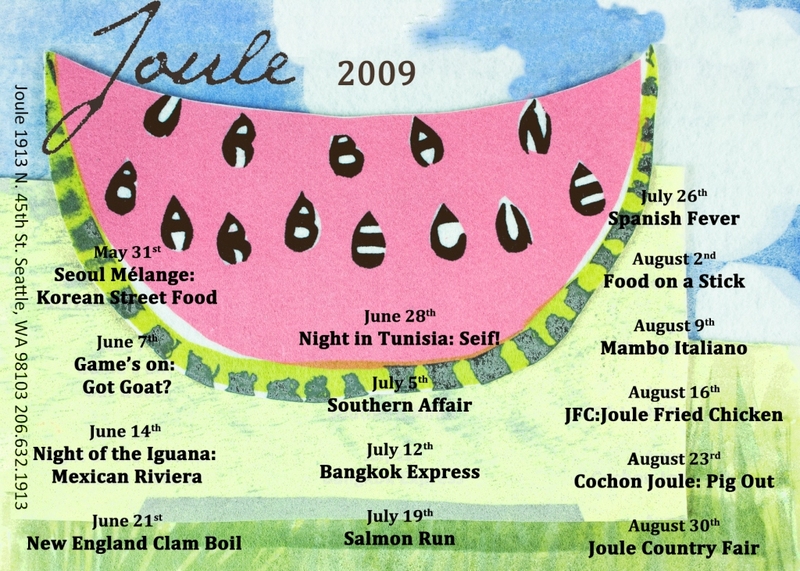 Each Sunday throughout the summer Joule had all sorts of different themes that were distinctive and fun, and allowed the team to try new culinary adventures. I’m excited to announce that the 2nd iteration of the Urban BBQ has started. Joule has climbed the charts on my list of favorite restaurants around Seattle. I feel this way for a bunch of reasons; their creative and delicious dishes, the friendly and welcoming vibe from Seif, Rachel and the team, and the total feel of the restaurant. Taking all of these things into account it’s easy for me to say that Joule is quite awesome. That’s why I’m pumped up to visit some of their Sunday BBQ dinners. All look interesting with a chance to get some good food. All dishes will be around $10 and the days events roll from 12-8pm. An added bonus is that live music will go from 2-4pm. This past Sunday May 31st, was the first for this summer, and the last will be on August 30th. They’ll also have stuff for kids to do too. It’s pretty cool and fun for the whole family. I would love to hit up all of them, but I’ve got my eyes set on 6/21, 7/5, 7/12, 7/26, 8/16, and 8/23. Hope to see you at some of these dinners. 6/7 – Game’s on: Got Goat? 6/28 – Night in Tunisia: Seif!